This two day stained glass course is designed for those who have already attended my one day stained glass course or similar elsewhere. You can make a larger and more ambitious project in 2 days and if you have time, cement your own panel on the second day. Before you come you will need to produce your original full size art work. I will guide you through this important process if you need help as a bit of homework is essential before coming! Once here we will create our cutline from your drawing. The size of panel you can make is around A3 or equivalent. 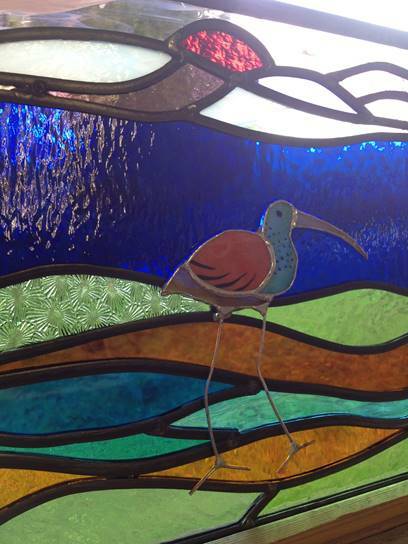 You can try your hand at glass painting or sand blasting to add more detail to your work or just stick to beautiful glass, the choice is yours on this very creative two day stained glass course. The painting can be fired overnight ready for leading on the second day. Acid etching can also produce some interesting effects. 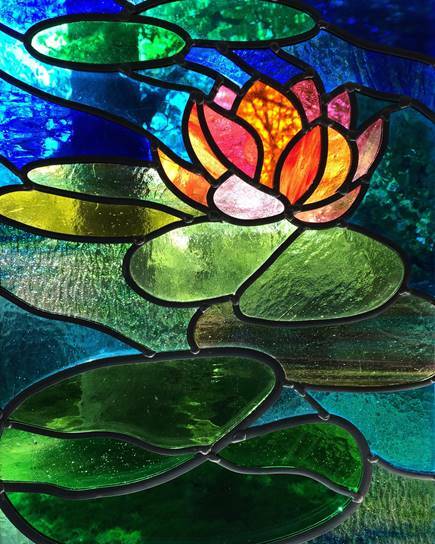 For all the work you do on The Next Step I will guide, aid and inspire you through the process of completing your own stained glass art work. Use of all tools and all materials are included in the cost of your course as are copious cups of tea. I usually hold one or two of these a year so look out for the date or pop an email over to me to go on my waiting list. Here are some photos from my two day Next Step stained glass course.